Sharon DeBiagio, a native Californian, was been Director of Curriculum with the Millbrae School District from 2004 through 2010. In her directorship role, she provided literacy staff development and curriculum planning for grades K through 8. She was previously a classroom teacher and school principal. While working in Millbrae, as well as private and public schools in the San Francisco Bay Area, she has been a strong literacy advocate. Sharon partnered with the Noyce Foundation project, Every Child a Reader and Writer and was a staff developer and coach with Accelerated Literacy Learning (A.L.L.) in 2009-2010. More recently, Sharon has been on assignment as curriculum consultant and reviewer for the San Mateo County Office of Education. Sharon's family was known for their storytelling skills which nurtured her love of reading and developed her appreciation of writing. Classroom experiences continue to open marvelous worlds of possibilities for children, and Sharon is first to recognize the joy and energy that teachers bring to teaching. Her work with Accelerated Literacy Learning (A.L.L.) 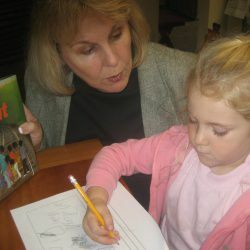 provides nourishment for her passion for writing and teaching.